The spectacular public and media attention focused on the Zoë Baird case earlier this year suddenly made many Americans realize that they were violating the law by employing illegal aliens and/or by not paying social security and unemployment compensation taxes for household employees. Often lost in the discussions were the basic reasons behind these laws and the importance of compliance for the well-being of our country and fairness to our workers — citizens and legally resident aliens alike. Employer sanctions were imposed by the Immigration Reform and Control Act (IRCA) in 1986 to close the job market to illegal aliens. Unfortunately, the proliferation of false documentation and inadequate enforcement have undermined the effectiveness of sanctions. The number of illegal aliens entering the United States is approaching pre-1986 levels, as indicated by the number of apprehensions at the border — 1.25 million in 1992, according to the Immigration and Nationalization Service (INS). Homecare — ranging from childcare to care of the elderly, ill and disabled, to cleaning and gardening — has continued to attract large numbers of illegal immigrants. These immigrants are able to compete for such jobs effectively because of the perception in the United States — however inaccurate — that limited skills are required. The prevailing poor wages and working conditions in homecare are a disincentive to potential American workers. It is a vicious circle: the supply of illegal workers keeps the wages low and discourages resident competition, thereby attracting more illegal aliens. On the other hand, the reductions in 1990 legislation of visas available to unskilled workers from about 13,500 annually to 10,000, together with increases in the number of applicants for these visas, caused an increase in the waiting period for persons to legalize their situation or to immigrate from a few years to an estimated 15 to 20 years. This limitation on entries and the lengthy waiting period for visas should serve as further markers that the United States does not need additional unskilled immigrants. Once here, the only hope illegal entrants have to normalize their precarious situation in the relatively near future is through a change in the law or a new legalization program. Meantime, the weakness of their negotiating position with employers and their willingness to accept poor pay and conditions further depress the job market. What is the solution to this situation in which citizens are often unwilling to work at the depressed wages and conditions offered for homecare, while illegal aliens continue to grow in number and are willing, even enthusiastic, to undertake this work? Immigration lawyers suggest that the United States adopt and broaden a new Canadian system and allow unskilled aliens to enter the United States temporarily for homecare jobs and to receive permanent residency after three years’ work in this capacity. In effect, they would offer an opportunity to legalize homecare providers already here and open an avenue for the admission to others; the opportunity for fraud would be substantial. Critics of this proposal warn of the dangers of further weakening of our immigration rules, the exploitation of workers this encourages, and the displacement of unskilled citizens and legal residents who, with training, would take this work if offered more respectable wages and working conditions. They call for more effective enforcement of employer sanctions, encourage training for the unskilled, and urge that market forces be allowed to operate and raise wages and conditions for citizens and legally resident aliens. They point to the country’s primary obligation to look after the needs of its unskilled citizens and legal residents. Another outcome of the discussion of illegal aliens and their employment in homecare could be a standoff between these options caused in part by the overload of the Administration’s agenda and by divisions within the Congress. Such an inconclusive result could leave the illegal immigra-tion issue virtually untouched and bring about only marginal, unsatisfactory changes in homecare regulations. The Administration seeks to raise the threshold for paying social security and unemployment compensation taxes. While this would ease the administrative burden on households and reduce the likelihood of Zoë Baird-type disclosures, it would jeopardize the Social Security coverage of some of the society’s poorest workers, and it would not address the employment needs of unskilled citizen and legal resident workers, or discourage illegal immigration. During the late 1970s and early 1980s the number of illegal immigrants crossing the border from Mexico into the United States grew at an alarming rate. Lacking firm statistics on these illicit entrances, the most relevant evidence supporting this conclusion was derived from the number of apprehensions at the border by the INS. That number climbed from 766,600 in 1975 to 910,000 in 1980, 1.2 million in 1984, and 1.8 million in 1986. The Select Commission on Immigration and Refugee Policy studied legal and illegal immigration from 1979 to early 1981. Its report in 1981 led to Congressional debates from 1981 to 1986 over a means to deal with illegal immigration. Ultimately, those lengthy debates and maneuvers resulted in the passage of the Immigration Reform and Control Act of 1986, known by its acronym, IRCA. IRCA made it illegal for employers knowingly to hire aliens unauthorized to work in the United States. This overturned 1952 legislation that allowed employers to hire undocumented aliens without incurring a penalty — the so-called “Texas Proviso,” a provision in the law absolving employers of aliens from concerning themselves with the nature of their employees’ status in the United States. IRCA also provided for the legalization of aliens present without authorization in this country on January 1, 1982. By 1992 over 3 million persons had applied for legalization and 2.6 million of them were granted legal residence status, including over a million agricultural workers. Initially, the threat of employer sanctions had a positive effect of discouraging illicit entries. 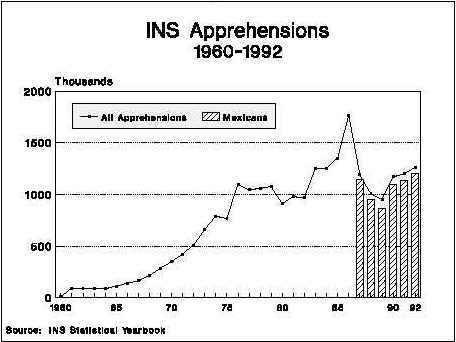 Apprehensions dropped sharply to 954,000 in 1989, but then they began to rise again, reaching 1.25 million in 1992. A major effect of the sanctions provisions was the proliferation of fraudulent documents required by IRCA to establish the right to work. There are 17 kinds of documents federal regulations recognize to establish work eligibility. They include a foreign passport stamped with an authorization to work, a so-called “green card” permitting permanent residence in the U.S., an INS employment authorization card, a social security card, a driver’s license and a birth certificate. The number of identity documents and the lack of safety features on them resulted in the production of fraudulent papers that have been generally sufficient to meet the needs of employers. Employers are required to examine, but not to verify, the documents they are shown. United States law provides that: (1) it is unlawful to hire illegal aliens (IRCA, 1986); (2) employers must pay Social Security and Medicare taxes for each household worker who is paid more than $50 in a calendar quarter and an unemployment insurance tax for each worker who makes more than $1,000 in a calendar quarter (amendments to the Social Security Act, 1950). Congress has considered in the past an increase in the $50 earnings threshold for paying Social Security taxes. A substantial increase in the quarterly threshold to $1,750 was passed by the House Ways and Means Committee in May 1993, as part of the Administration’s deficit reduction package. The present legal requirements, outlined in the accompanying box, break down to a series of steps. The first is the need to verify the applicant’s eligibility to work. The employer and employee, whether American or foreign, both sign INS form I-9, verifying that the employee is an American or a lawfully admitted alien with permission to work and that documents presented by the employee establish his or her identity. The “employer identity number,” or EIN is provided by the Internal Revenue Service (IRS) to employers for identification in the various reports and filings associated with employees, including tax returns, social security payments and the unemployment tax. If an employer does not have an EIN, one can be obtained from the IRS, using form SS-4. States also require their own identification numbers. The employer is required to fill out a quarterly form covering the payment of social security and any unemployment compensation taxes for the period. Income tax withholding payments are also made quarterly if the wages of the employee are sufficient to require them. Or, in the case of household help, the employee may request withholding by the employer. At the end of the year, the W-2 form certifying wages paid and taxes withheld for each employee are provided to the IRS and to the employee. The W-2 form sent to the IRS is accompanied by form W-3, a transmittal document. Some states also have unemployment compensation taxes, so it is necessary for the employer to verify the requirements of his or her state. While some complain of the complexity of this process and President Clinton has called for simplified procedures, the fact is that half a million households have complied with these social security and unemployment compensation tax procedures. The penalties for non-payment of social security and unemployment compensation taxes can be substantial, and the disclosure can come about without forewarning, sometimes years after the actual employment. For example, if an employee or former employee applies for social security at age 65, listing his or her former employments, the present or previous relationship and non-payment of tax could be disclosed. Or disclosure could occur when a former employee applies for unemployment compensation, and the employee and the government agency discover that appropriate taxes were not paid to provide for the payment of benefits. The penalties levied by the Social Security Administration can amount to a fine of up to 100 percent of the social security tax due, the tax itself, and interest. The penalties imposed by INS for hiring an illegal alien can be from $250 to a maximum of $2,000 for each illegal alien employed, in addition to another $100 to $1,000 for each failure to complete and maintain an I-9 form. Non-payment of federal withholding taxes and state taxes opens up the possibility of other penalties from the IRS and state authorities. The 1986 IRCA and the Immigration Act of 1990 were passed to help gain control over our borders and to discourage the entry of hundreds of thousands of aliens ignoring our immigration laws and jumping visa lines in their own countries. Employer sanctions sought to close the labor market as a magnet for illicit entries. Congress also recognized in enacting the 1986 Act the difficulty of deterring illegal aliens only at the border. The effectiveness of controls at the frontier was limited by the length of the 2,000 mile border with Mexico, the openness of our society, the pressures causing persons to leave their homes and attracting them to our labor markets, and the limitations of the INS, which has been chronically understaffed and underfunded. Sanctions offered another check on illegal immigration — at the place of employment, the primary objective of illegal aliens. There was debate in 1986 whether or not to exclude caregivers and household help from the provisions of the sanctions legislation. The initial argument that employers of four persons or less and households should not be burdened with compliance procedures was not accepted. Called by some “the Beverly Hills exception,” it was argued that the chief beneficiaries would be affluent Beverly Hills residents looking for gardeners, cleaning staff and maids, and the proposal was rejected. Congress determined that the coverage of IRCA sanctions should be universal, and so the hire of illegal aliens for work in the home was also made unlawful. Among the jobs that have attracted unskilled, legal and illegal immigrants is employment in the home — childcare, care of the elderly, the ill and the disabled, cleaning and gardening. While it can be argued effectively that childcare and care of the elderly and ill require special skills, experience and training, the fact of the matter is that, however shortsighted and unfair, our society undervalues these services and generally does not require such expertise. Persons are often hired for household work as if they were unskilled workers. The employers’ test more often is whether the prospective employee is seen as pliant and likely to be trustworthy. This apparent depreciation of child and homecare skills and the availability of illegal aliens meeting the latter requirements have caused the conditions of work and pay in many of these jobs to be so low that many Americans, even unskilled persons without work, are not attracted to them. But foreigners — new to the country, possibly illegal, probably lacking English skills and desperate for jobs — have proven willing and prepared to do this work. They may well have had no more training than U.S. citizens, but this occupation is often held in greater respect abroad, and immigrants who seek these jobs may be more accustomed to this work than most unemployed or unskilled Americans. The prospects for legal entry to the U.S. of would-be household help were made substantially more difficult by the Immigration Act of 1990. The State Department estimated that prior to this Act, about 13,500 visas were available annually to unskilled workers who might seek this kind of work. The 1990 Act reduced the number to 10,000. The result of that reduction and large numbers of applicants is that instead of waiting for a few years for their number to be reached, applicants registering now can anticipate a wait of 15 to 20 years. Their only hope for a shorter wait in their precarious situation is for a change in the visa requirements or a new legalization program. The Zoë Baird case brought its share of concern and a degree of hypocrisy into public discourse, and reminded Americans of the fact that most childcare and household help are covered both by the sanctions provisions of IRCA and by requirements to pay social security and unemployment compensation taxes. Particularly affected were middle income employers who suddenly discovered that these laws apply to them. Compassion is misplaced, however, for employers, at home or in a business, who are exploiting illegal immigrants by paying low wages, offering poor working conditions, and deliberately refusing to pay taxes that assure social security and unemployment coverage for their workers. Not affected by these legal requirements are low income families who must turn to affordable daycare services to enable them to make a living. They face separate problems unrelated to in-home services, which they cannot afford. Concern is owed to illegal immigrants who broke the law in coming to the United States but who once here have experienced exploitation and bad treatment. In a real sense they are the victims of the mixed signals coming from our country. Laws indicate that they are unwanted, but those laws are weak and poorly enforced, and employers often welcome these migrants for the cheap and compliant labor they provide in the home, business, industry and agriculture. As unfair as the conditions of employment may be, these jobs still serve as a magnet attracting others to this labor market. At the same time, we have to recognize that these illegal immigrants jumped the visa waiting line and entered or remained in the United States in violation of our laws. However exploited and unfortunate their situation may be and however motivated they may be to work, their claim to status in the United States is clouded by their manner of entry and by the unfair competition they represent to unskilled American citizens and legally resident aliens in the labor market. They remain in their tenuous situation (albeit better off than they might be in their homelands) hoping that the law will be relaxed, the waiting period will be reduced, or there may be another mass legalization to benefit them. When we are moved by compassion and the compelling individual situations experienced by illegal aliens, we need to remind ourselves that there are also compassionate and compelling circumstances of unskilled, poor Americans and legal aliens — minorities and Anglos alike. The job needs of the American underclass have long remained untended, while illegal aliens undercut job opportunities and depress wages. We have imposed upon ourselves a circular system. The depressed wages and conditions alienate the American underclass. This is sometimes expressed by resentment toward working under these conditions and in a negative attitude that potential employers reject. Employers often prefer the submissive and more cooperative comportment of aliens desperate for work and unlikely to question low wage levels. This vicious circle has to be broken, and a principal remedy needs to be the offer of better wages and conditions in a labor market for unskilled citizens and legal residents, one with a healthier balance between job-seekers and jobs. What about hypocrisy? Zoë Baird had to face the slings of Congress, the public and the media portraying her as a rich elitist, disdainful of a law she would be obligated to enforce. The idea was incorrectly implied that, in contrast, the rest of the nation was in dutiful compliance with the law. Surely Zoë Baird’s hiring of illegal aliens was inconsistent with her appointment to lead the nation’s law enforcement department and to supervise the Immigration Service. But the Baird case also exposed much wider disregard for the law. The evasion of employer sanctions in the home is widespread, and so is the failure to pay social security and unemployment compensation taxes. It soon came out that two million household workers were recorded by the Census, but the employers of only half a million were paying the obligatory social security taxes. Fortunately for Congress, there was no authoritative inquiry into how many in the legislature were as guilty as Zoë Baird in their dealings with household help. Except for top-level appointees, the Executive Branch did not have to examine itself. Those who respected the law and hired American citizens and legally resident aliens and paid their taxes proved that homecare and childcare can be obtained legally and paid fairly. The debate over what to do about illegal aliens and household workers has proponents and interested parties that fall into a number of camps with different perspectives. Employment agencies dealing with care providers, frustrated over the difficulty of obtaining adequate numbers of trained or experienced Americans and legally resident aliens willing to do household work, sometimes call for admission of illegal aliens so that they can tap this source of cheap labor to fill the market demand. Nannies, who remain largely unorganized, unheard and concerned over the status of their work, lack recognition of their professionalism, and generally receive low wages and often experience poor working conditions. Single and married persons badly needing homecare, bewildered by complex government regulations, and concerned over costs, are often convinced that cheap, alien labor provides their “only” answer and are prepared to hire whomever is available at the lowest cost. Immigration lawyers, minority advocacy groups and refugee sponsoring organizations call for a procedure to legalize alien homecare providers. A variety of employers increasingly turn to enterprises that provide these personal services on a contract basis so that the responsibility for dealing with the legal requirements is moved from the employer to the private contracting firm. Unskilled and unemployed citizen and legal resident workers generally have been ignored as to their views on the matter or whether they would be willing to provide homecare at a respectable wage. Essentially, there appear to be three possible outcomes at this point in the debate. There is a proposal by immigration lawyers, based in part on a Canadian program, that would legalize homecare providers. Immigration reform groups call for more strict enforcement of employer sanctions and the training of unskilled and unemployed citizens and legally resident alien workers to perform these tasks with higher levels of pay and better working conditions. There is also the possibility of an inconclusive debate, with only marginal changes being made, such as raising the threshold for required social security and unemployment compensation taxes, and without resolving the core homecare and immigration issues. Canada’s regulations for live-in caregiving became effective in April 1992. This employment is distinguished from jobs for persons who live outside the household; there is no shortage in Canada of workers for these positions. The regulation permits workers to come to Canada on a so-called temporary basis to perform certain kinds of live-in work — childcare providers and home support for seniors and the disabled. Actually, the program leads to permanent residence for aliens fortunate enough to participate in it. The requirements for homecare employment of foreigners in Canada include an education equivalent to 12th grade and six months’ full-time training in caregiving to children, the elderly and the disabled. The instruction can be an accumulation of part-time training, but it must be under a qualified educator or trainer and result in a rated assessment by the trainer. The person must speak, read and understand English or French at a level sufficient to communicate effectively in an unsupervised situation. The employee, who must live in the employer’s home, gains the right to apply for permanent residence status after completing two years’ employment in this work. Other provisions cover acceptable working conditions, duties, fair wages, privacy and freedom of movement. AILA has proposed an adaptation of the new Canadian system. The homecare worker would be certified by the U.S. Department of Labor as not taking a job away from citizens or legal residents at the wages and conditions currently prevailing in the local market. (This is a system that perpetuates existing job conditions and wage levels and ignores the possibility of workers being available at better wages and conditions.) The immigrant would have to work in a homecare capacity for three years before becoming eligible for permanent residence status. The employee could change employers, thereby avoiding the creation of indentured service, so long as the basic function did not change between jobs. Once gaining resident status, the employee would be free to seek whatever employment he or she wanted or remain in homecare. Would homecare be as narrow as the Canadian system (limited to live-in care) or does it cover homecare workers living outside the place of employment or maids, house cleaners and gardeners? Obviously, the broader the coverage the greater the likelihood of fraud and abuse. What experience or training is required? Is there any limitation on the numbers permitted to benefit from the proposed program? Proponents of this proposal claim that these jobs do not attract American workers, and that there is a crisis in meeting these employment needs. Newly arrived foreign workers are willing and able to take on these tasks. Present laws discourage the match between positions and willing workers; this would be corrected by legalizing alien homecare providers. Aside from their concern over potential fraud and abuse, critics of the lawyers’ proposal point out that it would surely become another magnet to draw even more illegal aliens to the United States. The only way to combat the growing flow of illegal immigrants abusing our laws and taking jobs from Americans and legally resident aliens is to enforce employer sanctions effectively. There is a parallel in the Special Agricultural Worker (SAW) legalization program established in 1986 by IRCA. The INS experienced difficulty establishing criteria for eligibility and sticking to them. It resulted in the legalization of over a million aliens, in many cases fraudulently, and a glut of workers in the farm labor market, further driving down wages and working conditions in agriculture. And it acted as a magnet attracting still more workers to the U.S. in hope of benefiting from further legalization programs. Labor economist Vernon Briggs argues convincingly, “The United States in the 1990s already has far too many unskilled workers at a time when demand for such workers is contracting.” In testimony in February 1993 before the Commission on Immigration Reform, he pointed out that unskilled citizens and resident aliens form a large pool of potential workers for the household, childcare and eldercare if they are trained for those jobs and attracted by fairer wages. The labor market contains both large numbers of unskilled and often unemployed Americans and legal residents together with large numbers of unskilled, illegal aliens. The latter are willing to work under deplorable conditions for poor pay, thereby driving wages and conditions down. In the traditional economic sense, it is clearly a matter of oversupply of labor driving down wages. According to Briggs, when employers complain that they cannot find Americans willing to do this work, the truth is that the presence of unskilled illegal immigrants willing to work in sub-par jobs makes that conclusion a self-fulfilling prophesy. All too often, by circumstance or design, employers are taking advantage of the weak bargaining position and tenuous situation of the aliens. What is the answer for people, like Professor Briggs, who want to protect American workers and abolish the exploitation of illegal immigrants? They would prevent illegal aliens from working by strengthening employer sanctions. They would adopt a secure worker identification card to exclude more effectively illegal aliens from the job market and open job opportunities to unskilled citizens and legal residents. They would encourage the unskilled to seek and the government to support training. They would let the demands of the market raise wages and improve conditions so that our disadvantaged residents become attracted to more respectable and better paying work in the home. They would encourage small business to develop homecare options that offer quality service at reasonable prices to persons with homecare needs. Given the Administration’s overloaded agenda and divisions within the Congress, and with public opinion and immigration advocates divided over the effects of immigration, the present debate could result in a standoff and inaction or only token reform. The current legislation to change Social Security withholding provisions is an example of brushfire management. It would not liberalize or restrict the hiring of illegal aliens, but it is susceptible to being characterized as diminishing government red tape and, therefore, responsive to the public mood. It would remove an apparent quirk in the law that surfaced to public attention in the Baird case. The beneficiaries of such a change, however, will not be the general public, but rather the employers of domestic workers. The Social Security coverage for homecare workers was intended to provide greater protection to unskilled workers. The proposal to “liberalize” the earnings level threshold would jeopardize social security coverage for some of society’s poorest members. If there is no real change in the system, the question becomes: what will be the final result of the Zoë Baird case? The answer in this instance would seem to be that illegal immigration was once again ignored and we would have only adjusted the standard for social security tax payments. Elite and middle class families would have easier access to low-paid homecare. Homecare workers would still be underpaid and subject to exploitation. Inaction would do nothing to stem the flow of illegal immigrants into the United States. It would perpetuate the message that the INS, the public and the U.S. government are not serious about the nation’s immigration laws and would encourage even more illegal migration. Maintenance of present procedures would also perpetuate the exploitation of immigrant labor. It would forestall upgrading domestic employment to make it a more attractive and respected occupation.